If there is one thing that is special about Windows 10 then that is the Cortana integration. Cortana is your digital assistant that can do a lot of things. If you don't like Cortana or not using the digital assistant feature, you can easily disable Cortana permanently on Windows 10 from Group Policy Editor. When I say Cortana can do a lot of things, I'm talking about basic things like creating reminders, settings up alarms, helping you with definitions, spellings, and conversations, etc. As you can guess, Cortana has a long way to go before it can be really useful. I mean, you cannot use Cortana to shutdown or schedule Windows shutdown, you cannot ask Cortana to open a file or program, cannot uninstall programs using Cortana, etc. Add to all this, Cortana collects a lot of data about you. Even Microsoft knows this and separating Windows search and Cortana. If you are like me and not using Cortana all that much or at all, you can easily disable Cortana completely with just a few clicks. Let me show you how. There are two methods to disable Cortana permanently. The first method follows the group policy editor and the second method follows the registry editor. If you are Windows 10 Pro or Enterprise user, follow the group policy editor. Home users can follow the registry editor method. Before making any changes to your system, it is better to create a system restore point on Windows 10. The restore point will help you restore your system to its know good state. Windows 10 Pro and Enterprise users have access to group policy editor which makes it quite easy to turn off Cortana permanently with just a few clicks. All you have to do is find the policy and disable it. It is very easy to do, just follow the below steps. Search for "gpedit.msc" and open Group Policy Editor. Go to "Computer Configuration -> Administrative Templates -> Windows Components -> Search". 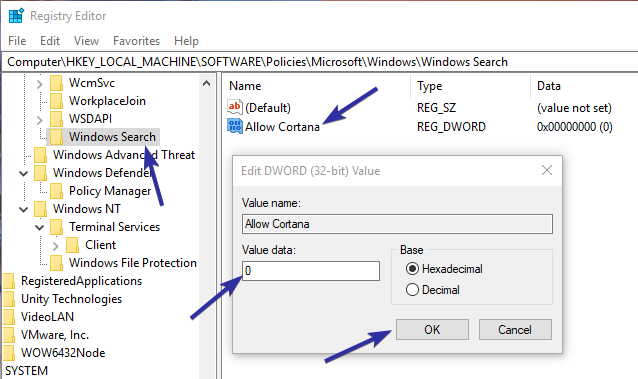 On the right pane, find and open "Allow Cortana" policy. Select "Disabled" radio option in the policy settings window. That is, you've disabled Cortana permanently on your Windows 10 system. If you want to enable Cortana back again, just select "Enabled" or "Not configured" in step 5 and save changes. Home edition users don't have access to group policy editor. So, as an alternative, you can use the registry editor to disable Cortana permanently on Windows 10. Though it is quite easy to follow the registry method, create a registry backup before making any changes just to be on the safe side. To make your life easier, I've created a registry shortcut which you can download and execute to disable Cortana. The good thing is, the reg file will automatically create and configure the required keys and values automatically. Curious users can open the .reg file with Notepad to see what keys and values we are creating. Note: If you are not comfortable with downloading files, follow the manual method shown below. Download disable Cortana reg file, open the zip file and extract .reg file to the desktop. 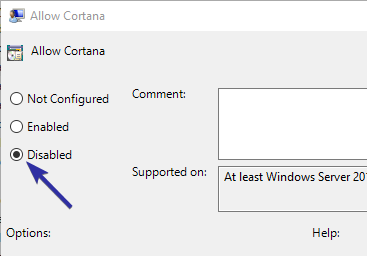 Double-click on the "DisableCortana.reg" file. When warned or prompted click the "Yes" buttons to merge the registry settings. That is it. Restart your system and Cortana will be disabled completely. If you want to enable Cortana, download enable Cortana reg file and follow the above steps. Search for "regedit" and open registry editor. Right-click on the "Windows" key on the left pane and select "New -> Key". Name the new key as "Windows Search"
Select the newly created Windows Search key on the left pane. On the right pane, right-click and select "New -> DWORD (32-bit) Value". Name the value as "AllowCortana". Double-click on the AllowCortana value. Set value data to "0". Restart your system and Windows 10 will automatically disable Cortana permanently. If you want to enable Cortana in future, set the value data to "1" in step 10 or delete the AllowCortana value from the registry. As you can see, it is rather easy to disable Cortana permanently on Windows 10. If you are still seeing the Cortana icon on the taskbar, right-click on the taskbar and select "Cortana -> Hidden". Hope that helps. If you like this article, do check out how to enable automatic login on Windows 10 and how to disable Windows 10 notifications.